This was 1945. Many were university students who had been previously exempt from service, but now Japan was running out of troops. Hisashi Tezuka recalls that a few of his colleagues quickly wrote their replies and strutted away. But he and most of the others stayed for what felt like hours, unable to decide. He did not know then if anyone had dared to refuse. He learned later that the few who did were simply told to pick the right answer. “I did not want to say I wished it. I didn’t wish it,” he said in his apartment in Yokohama. They were the kamikaze, “the divine wind,” ordered to fly their planes into certain death. The U.S. Strategic Bombing Survey and data kept at the library at Yasukuni Shrine in Tokyo estimate that about 2,500 of them died during the war. Some history books give higher numbers. About 1 in every 5 kamikaze planes managed to hit an enemy target. Books and movies have depicted them as crazed suicide bombers who screamed “Banzai” as they met their end. But interviews with survivors and families, as well as letters and documents, offer a different portrait — of men driven by patriotism, self-sacrifice and necessity. The world they lived in was like that multiple-choice form: It contained no real options. First-born sons weren’t selected, to protect family heirs in feudalistic-minded Japan. Tezuka, then a student at the University of Tokyo, had six brothers and one sister and wasn’t the eldest. So he was a good pick, he says with a sad laugh. He was given a five-day leave to visit his parents. He didn’t have the heart to tell them he had been tapped to be a suicide bomber. He survived only because the Emperor announced Japan’s surrender on a radio broadcast, just as he was on a train headed to take off on his kamikaze attack. He was 23. Now, at 93, he notes that he has lived four times as long as many kamikaze. He loved flying the Zero fighter, so much so that he couldn’t stomach flying a commercial jet after the war. And, so sick of war that he didn’t want to join the military, he started an import-consultant business. He often visited American farmers. He never told them he had been a kamikaze. A burly man with a quick wit, Tezuka hands a reporter a sepia-toned photo of himself as a Zero pilot, grinning in a helmet, the trademark white silk scarf at his neck. “That’s to keep warm. It gets really cold up there,” he says. He picks up a miniature toy Zero, a gift from his daughter, and smiles as he turns on its buzzing propeller. He recalls training, flying in a dazzling formation over forests and lakes. It was so breathtaking you could almost forget the war. Zero pilots were the heartthrobs of the era. In fading photographs, they pose in portraits, hugging shoulders, wearing big smiles, seemingly oblivious to what lay ahead. Their goggles are flipped cockily over their helmets, their scarves tucked under their jackets. The Zero won accolades, even from the enemy. Some Japanese enlisted just to fly the Zero. Masao Kanai died on a kamikaze mission near Okinawa in 1945. He was 23. Under a program that encouraged students to support the military, he had been pen pals with a 17-year-old schoolgirl, Toshi Negishi. All in all, they exchanged 200 letters. They tried to go on a date, just once, when he had a rare opportunity to get out of training and visit Tokyo. But that was March 10, 1945, right after the massive air raids known as the Tokyo firebombing. So they never met. Before he flew on his last mission, he sent her two tiny pendants he had carved out of cockpit glass — one a heart, the other a tiny Zero. The hazy crystalline heart has the letters T and M, their initials, carved on top of each other. Negishi wore the pendants just once. She kept them in a box for 70 years. She recently donated the jewelry to a memorial for the Tsukuba Naval Air Corps, a command and training center for kamikaze in Kasama, Ibaraki Prefecture. Community volunteers determined to preserve the memory of the kamikaze are trying to block plans to tear down the building from that period. Though other memorials exist for kamikaze, no one, until recently, had bothered to look into or document the history of the Tsukuba building. “Someone has to remember. It hurts too much if we don’t,” Negishi says in a forthcoming film made by the volunteers. One of the eeriest photos on display is a woman decked out in a bridal kimono, sitting with dozens of family members and grasping a framed picture of her dead fiance, a kamikaze. The bride in that post-mortem wedding, Mutsue Kogure, stares into the camera, expressionless. The last letter Nobuaki Fujita, 22, wrote to her is also on display. Seventy years after the end of World War II, the runway that once stretched at Tsukuba is long gone. But the rows of cherry blossoms still stand. In another corner of the Tsukuba grounds, an underground bomb shelter winds in pitch darkness through several chambers. It was designed to serve as an emergency command, should the main building be demolished in a U.S. bombing. It’s a reminder of the illusory determination that gripped the military, to keep fighting, no matter what. In training, the pilots repeatedly zoomed perilously, heading practically straight down, to practice crashing. They had to reverse course right before hitting the ground and rise back into the sky, a tremendous G-force dragging on their bodies. When they did it for real, they were instructed to send a final wireless message in Morse code, and keep holding that signal. In the transmission room, they knew the pilot had died when a long beep ended in silence. 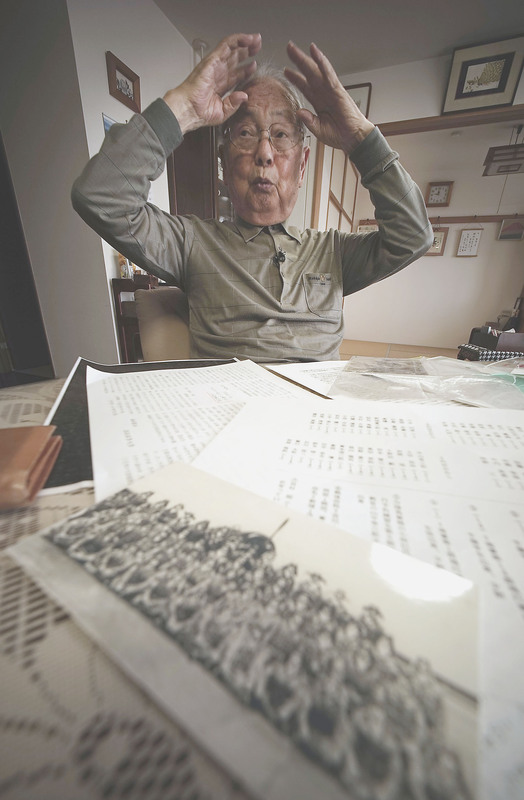 Yoshiomi Yanai, 93, survived because he could not locate his target — a rare error for a kamikaze operation. He visits the Tsukuba facility often. “I feel so bad for all the others who died,” he says, bemoaning the fate of comrades who died so young, never having really experienced life. Yanai still keeps what he had intended to be his last message to his parents. It’s an album that he keeps carefully wrapped in a traditional furoshiki cloth. He plastered the pages with photos of him laughing with colleagues and other happy moments. He got a pilot friend to add ink drawings of the Zero. Maxwell Taylor Kennedy, who wrote about the kamikaze in his 2008 book, “Danger’s Hour,” says the kamikaze were driven by nothing but self-sacrifice. Kennedy stressed that kamikaze have little in common with suicide bombers today. Japan was engaged in conventional war, and, above all, kamikaze had no choice, he said. Civilians were not targets. Though the Zero was used in kamikaze missions, it was not designed for the task. The Ohka was. It was a glider packed with bombs and powered by tiny rockets, built to blow up. They were taken near the targets, hooked on to the bottom of planes, and then let go. The name of the plane derives from ohka, a formal word for cherry blossom, and to this day kamikaze are associated with the briefly glorious trees. Americans called it the “Baka bomb.” Baka is the Japanese word for idiot. Because their cruise range was so limited, they were easily shot down. The job of overseeing and training Ohka pilots, and ultimately sending them to certain death, fell to Fujio Hayashi, then 22. Hayashi believes the Ohka might never have materialized if there had been no volunteers when the concept for the plane was first suggested. He was one of the first two volunteers for the Ohka. Dozens followed. But he could never stop blaming himself, wondering whether his early backing helped bring it about. When he finally saw one of the flimsy gliders, he felt duped; many thought it looked like a joke. 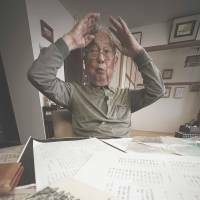 Over the decades, Hayashi was tormented by guilt for having sent dozens of young men to their deaths “with my pencil,” as he put it, referring to how he had written the names for Ohka assignments each day. To squelch any suspicion of favoritism, he sent his favorite pilots first. After the war, Hayashi joined the Self-Defense Forces, and attended memorials for the dead pilots. He consoled families and told everyone how gentle the men had been. They smiled right up to their deaths, he said, because they didn’t want anyone to mourn or worry. Hayashi hardly spoke about his kamikaze days with his children. They remember him as a dad who loved classical music, took them to amusement parks and loved cats so much he adopted strays. “I think of the many men I killed with my pencil, and I apologize for having killed them in vain,” he said. He often said he wanted his ashes to be scattered into the sea near the southern islands of Okinawa, where his men had died. Until then, he said, his war would never be over. He died of pancreatic cancer at age 93 on June 4. His family plans to honor his request.